IN THE REAR PARKING LOT of, R.L. WILLIAMS Co.
just under the 90 ' EDMOND WATER TOWER. TALKIN FREQ. 146.790- With, PL tone 100 hrz. When hams think of communication, they think of ham radio as the ONLY form of communication during disasters. 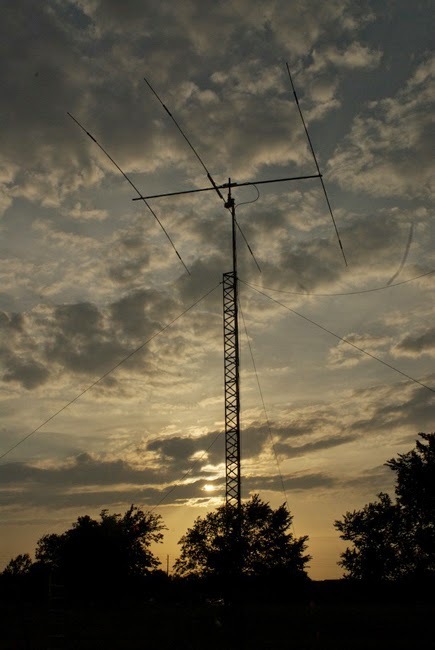 When Survivalists think of communications, they think of ham radio as the BEST form of communication during disasters. While hams have the Amateur Radio Emergency Service and Skywarn, the Preppers think about themselves, their family, their friends, their neighbors. Are you serving the public with your ham radio station? Do your neighbors know? Last year, this photo made the rounds on social media as it commemorated the "night shift". This year, have your Field Day plans come into play? Did you test out your equipment during the Simulated Emergency Test? Did you use the Incident Command System to plan your events? Are you gearing up for the Simulated Emergency Test? To participate in this year’s emergency test, contact your local ARRL emergency coordinator or net manager to find out the details. ARRL Sections, ARES teams and nets may conduct their exercises anytime during September through December. If you don’t know who to call, please touch base with your ARRL Section Manager for assistance. See page 16 of QST for contact information or check the ARRL Web page. The URL to start with is http://www.arrl.org/sections/. From there, you’ll find links to ARRL section home pages with names and contact information for your Section Leaders including the Section Emergency Coordinator and Section Traffic Manager. Whether you’re a new licensee or an experienced radio amateur, the SET is a golden opportunity to learn or practice useful skills in traffic handling, net operation and emergency communications protocols and management. 1. To find out the strengths and weaknesses of ARES, NTS, RACES and other groups in providing emergency communications. Google Groups: "rec.radio.amateur.moderated" is USENET technology which was (and still is to some) popular from the days of the internet over dial-up. This group and Rec.Radio.Swap offer digest messaging which gives users the ability to get ONE email per day, rather than every message, plus one does not have to use USENET with their primary email address, thus eliminating SPAM. What is your favorite online ham radio information source? posted on the West Gulf Division website. "flyer" link listed on the page. Don't miss this important convention. found on the nomination forms. "2015 WGD Annual Awards" in the middle of the page. Download the nomination forms and submit your entry today! Do you stream your repeater? The Caprock Intertie Link System is on Broadcastify. While this is just one method for streaming your system, do you? The others streaming on Broadcastify at at the link. Why do you stream your system?